Eubel's strong play in the US Senior Open Sectional, Qualifying for the US Senior Amateur, a top finish in the Ohio Senior Amateur as well as his tie for fourth in the Senior Metropolitan, allowed Ron Eubel to finish on top of our Senior Play of the Year Point race for the 2018 season. This is Ron's first Player of the Year honor although he did win the Metropolitan Championship in 2003 at Greene CC. 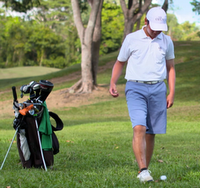 The player will get no penalty for causing it to move, and the ball will always be replaced; if the exact spot is not known, the player will replace the ball on the estimated original spot (including on, under or against any attached natural or man-made objects which the ball had been at rest under or against). Marissa Wenzler’s second straight 1-under par 69 and two-day total of 2-under 138 on the Gray Course led to her capturing the Ohio High School Girls Golf Championship last weekend at the OSU Facility. Her Centerville Team finished in third place in the Team Championship. Over in the Boys Division on the Scarlet Course, Austin Greaser finished in 3rd place, earning first team all state honors and Tyler Goecke finished in 7th place, earning second team all state honors. Congratulations to all our High School Golfers who competed this past season and we look forward to following you in the future. Cedarville finished in the middle of the pack this past week in their NCCAA conference championship on the Conservatory Course at the Hammock Beach Resort on the coast of Florida, Isaac Wood was the teams top finisher at 11th place. Wright State finished up their season playing in Muskies Classic at Maketewah CC this past Monday and Tuesday and finished in 11th place. 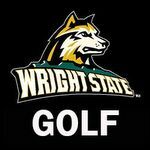 Interested in supporting the WSU Golf Program? The Fall meeting to conduct affairs and review the 2018 season was held this past Wednesday Evening. Our 2019 Trustees where elected and our Executive Committee was appointed. Our President for 2019 is Doug Miller, our Vice President is Dan Sutherly, our Treasurer is Bob Rice and our Secretary is John Sherman. 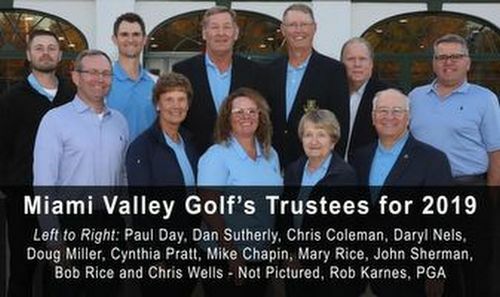 Thanks to all of our Trustees and our over 100 volunteers who support our game in the Miami Valley.